Turning the front tire into the lean prevents the bike from falling. 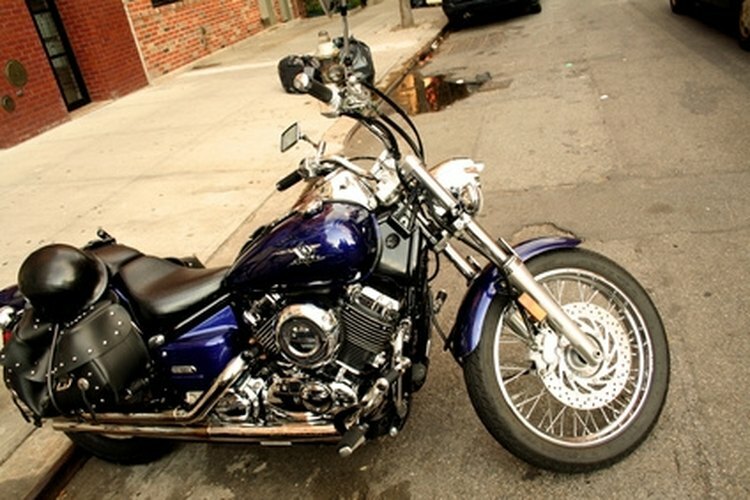 Keeping to a regular schedule of changing the oil in your 1996 Honda Magna will keep the motorcycle in good running order. Changing the oil every 3,000 miles is a good rule to follow. Oil is necessary to prevent the internal pistons and other moving parts in the engine from overheating and becoming damaged. What type of riding you do and where you do it will determine what weight of motorcycle oil you should use. While it is never a bad idea to stick with the manufacturer's recommended oil weight, switching to a lighter or heavier oil during summer and winter seasons can benefit the engine. Straddle the motorcycle and start the engine. Let it warm up to normal operating temperature, shut the engine off, then dismount after making sure the supporting kickstand is on solid ground and the front tire is turned into the lean of the bike. Place a drain pan under the drain bolt on the bottom of the engine oil pan attached to the engine block. Remove the oil drain bolt using a socket wrench and socket. Replace the oil drain bolt in the engine oil pan when oil is no longer flowing out into the drain pan. Remove the oil fill bolt, located on the left side of the crankcase just forward and up from the shift pedal, by pinching the raised center ridge of the bolt and turning it counterclockwise by hand until it comes free. The bolt will be clearly marked with the word "Oil" or the graphic image of a drop of oil. Insert the narrow end of the funnel into the crankcase through the oil fill hole. Pour in about 3.3 qts. of 15w50 oil; the Magna may not need all of the oil if the oil filter has not been changed as well. Replace the oil fill bolt and turn it clockwise until hand tight. Change the oil filter after the oil has been drained from the motorcycle. Grab the filter and turn it counterclockwise to unscrew it from its engine mount. Pull the old filter off. Wipe a thin layer of oil on the gasket of the new filter and screw it into place on the engine. Use caution when draining oil, as the oil can be hot enough to cause burns.